Economically Correct | "ergonomically correct office products at economically correct pricing"
Welcome to Economically Correct Office Furniture. Providing quality new and refurbished office furniture to the Minneapolis, St. Paul and greater Minnesota area since 1993. We specialize in quality pre-owned and refurbished Herman Miller and Steelcase workstations, New used and refurbished seating, filing and conference furniture from a wide variety of manufacturers. Reconfigurations, moving, additions to your office can be a stressful experience. Economically Correct would love to eliminate your stress. Our highly talented team will walk you through the process from design to delivery and installation. Economically Correct has a vast library of furniture manufacturers. We are sure to meet any design expectation your space requires. Economically Correct was founded in 1993, by Marc Ries, on the belief that all business relationships should be grounded in honest client relations, integrity and a superior level of customer care. We aim for excellence in service, quality, and value. We strive to provide our customers with the best office furniture products and services possible. We use our past experiences and knowledge to enhance future performance. We believe that our customer comes first. Economically Correct Inc. strives to understand our customer’s needs, goals and long-term plans, so we can then design a cost-effective furniture solution. Our professional sales staff; high-quality products; refurbishing process and professional, experienced installers will ensure your office move, reconfiguration, updates or additions will produce a work environment that exceeds your expectations by meeting your design tastes and needs while not exceeding your budget. The cost of new furniture continues to increase but the costs for high quality used or refurbished furniture does not. We like to provide a mix of new, used and refurbished furniture where appropriate to provide our customers with very attractive solutions that match budgetary needs. Economically Correct office furniture provides high quality new, used and refurbished workstations, desk sets, chairs, filing & conference room furniture. We stock large quantities of quality used workstations originally manufactured by Herman Miller, Haworth & Steelcase. Many of these inventories are in very good condition and can be used “as is” or Economically Correct can refurbish them to a like new condition for a fraction of the original cost. NEW Flip Top Nesting Table. Call for size and color options, along with price. Name: PL Laminate Series Bookcase S.T.H.R.M. PL Laminate Series 2 Door Bookcase S.T.H.R.M. Available in Espresso, Modern Walnut, Mahogany, Honey, and Cherry. USED 36″ 5D Lateral File. Please call for quantity and price. USED 4D Lateral File. Please call for price, size options, and quantity. Want a change of height option without getting rid of the desk you already have? This platform alows you to transition from siting to standing effortlessly. Left Hand Metro Desk Set. Call for price and size. 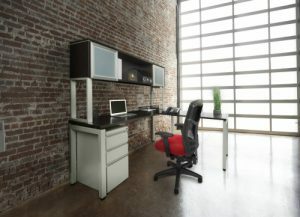 NEW Executive PL Laminate Desk #1. other colors and layouts available. NEW Executive PL Laminate Desk #3. other colors and layouts available. Presto combines the sleek executive look you require and the functionality of a task chair. Chrome star base and reinforced seat ensure durability and allow 350 lbs weight capacity. Full function mechanism, ratchet back, adjustable arms, and seat slider cater to your comfort needs. Molded foam, contoured seat, and CoolMesh comfort fabric come together to make Body Form Seating extremely comfortable. Created for maximum comfort, the Bolero features a waterfall seat and fully padded arms. All components of this chair are of superior strength and durability to offer a 450 lbs weight capacity. The perfect complement to the contemporary work space or home. Concerto Series features a wide open architecture, an electric tubular design, and outstanding comfort. Heavy duty spring construction and deep cushioning. Available in Black Leathertek. Cornet Series was designed as a functional stacking chair with a sleek, modern design. It offers multiple color choices and optional casters at an affordable price. Also availible with arms. The Drone Series has been redesigned for an industrial setting. Mesh back encourages full body contact for lumbar support, whereas CoolMesh seat allows for all day comfort. Steel footring and titanium base were added for increased durability. Optional black foot ring also available. Name: Jazz III High Back S.T.H.R.M. Jazz III High Back S.T.H.R.M. A Fabric back was added to the signature European design, while the no-contact chrome arms and pneumatic height adjustment were kept from previous models. With two different fabric options and an armless model available, Jazz III Series is a perfect addition to any executive office or boardroom. Name: Jazz III Mid Back S.T.H.R.M. Jazz III Mid Back S.T.H.R.M. LB5 Reception Chair. Many different fabrics and sizes to choose from. LL1 Reception Chair. Many fabric and sizing options available. LM3 Reception Chair. Many fabric and sizing options available. LN2 Reception Chair. Available in many fabrics and sizing. Name: Manhattan Reception Seating S.T.H.R.M. NEW NOVO Task Chair. Comes in multipal colors. Electric Blue shown. NEW Sit On It Torsa Chair One of Sit On It most popular chairs. call for price and fabric options. A full function mechanism brought to a task chair, at a great price. Pitch Perfect offers 3 paddles for back angle adjustment, pneumatic height adjustment, and seat angle tilt lock. Ratchet back and tension control are also included. Seat slider is optional. Name: Riviera Mid Back S.T.H.R.M. European designed executive seating ideal for any office environment. One touch locking swivel tilter and pneumatic height adjustment allow you to easily customize this chair to your preference. Contemporary designer base, durable Black Leathertek and sleek curves provide both outstanding ergonomics and aesthetics. Outfitted with antibacterial PVC on the seat and back, this guest chair is ideal for outfitting any area in a healthcare setting. The fame is made from powdercoated steel allowing for superior durability and higher weight capacity. Name: Trio Reception Seating S.T.H.R.M. Sleek European styling makes Trio Reception Seating the perfect choice for office or home. Featuring contemporary design, durable construction and outstanding comfort, Trio offers quality and value. Available in black Leathertek. Used HON guest chairs. Sled base and post leg options. Screen Printed Panel Fabric. Call for price. Name: U-Leg Bridge 4 Person Workstation S.T.H.R.M. U-Leg Bridge 4 Person Workstation S.T.H.R.M. Name: U-Leg Bridge Workstations With Hutch S.T.H.R.M. U-Leg Bridge Workstations With Hutch S.T.H.R.M. “Sherri, Just want to shoot you an email and tell you how pleased I am with the install. Your guys are top notch, very polite and keep you informed on what they are doing. Great experience AGAIN from start to finish. Michael was a pleasure to work with.